Services Welfare – Sanction of expenditure on obsequies of deceased Government Employees – Amendment - Orders – Issued. 1. G.O.Ms.No.122, GA(SW) Department, Dt: 11.04.2016. 2. From the Finance Department,U.O.Note.169/A2/BG/2016 dt:04.06.2016. In the G.O. 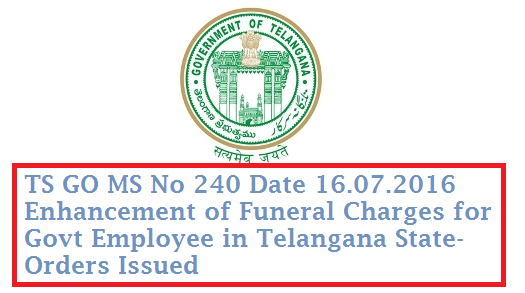 1st read above, the Government have enhanced the obsequies charges from Rs.10,000/- to Rs.20,000/- (Rupees Twenty Thousand only) to all categories of Government Employees to meet the expenses on obsequies ceremony, in case of death while in service. 2. In the U.O. 2nd read above, the Finance (BG) Department have requested to amend the detailed head of account as “310-Grants-in-Aid. 318 – Obsequies charges” instead of “310-Grants-in-Aid. 312 – Other Grants-in-Aid” under respective Major, Minor and Sub-Head of account of the departments concerned, issued in the 1st read above. Accordingly, Government hereby issue the following amendment to the G.O. 1st read above.